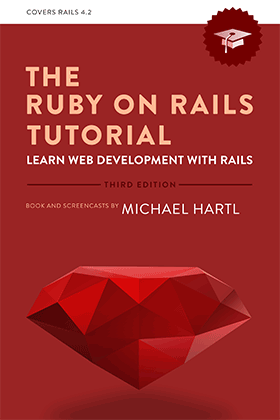 Once you've learned the essentials of Rails, you may be interested in going through other tutorials or books. You should already know a fair amount of the material covered in beginner-focused tutorials, so we'll just mention a couple worthwhile resources and you can pick one to to expand your knowledge. Learn Ruby on Rails by Daniel Kehoe (who advised this project) is geared at complete beginners, but it also covers some different topics than this course. See also Kehoe's sample Rails Apps on Github to see the code for various basic Rails Apps. For tutorials that show you how to develop these basic apps, consider subscribing to his Rails Apps Tutorials. You'll also receive a free copy of "Learn Ruby on Rails" with your Rails App subscription. Finally, if you're interested in quickly generating starter Rails apps, look at Rails Composer which offers a command line wizard for setting up a Rails app. Learn about the different components of Rails in more detail. You can buy the ebook from the publisher or get a hard copy on Amazon below. Often, you'll just want to learn about a specific topic instead of reading a whole book. See the next page for more info. Buy through the links below to support Learneroo.